Went to Donna's parents for weekend, so only got to fish sat am before leaving and 6-8pm sunday night. Skunked both times. Worked exclusively topwater. Tonight, I again worked topwater, but did toss a few Kastmasters. 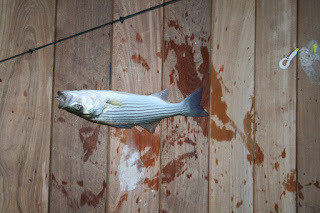 Picked up 1 WP at stump and a nice 18 inch Striper at the Marina light. Fairly cool evening with breeze blowing in and tide moving out.